Does pride for your country ooze from every fiber of your being? If so, congrats because you're proud to be an American (just like the song!). Advertising your American pride is a passion of yours and exercising it every chance you get is basically essential to your existence which explains your collections of flag attire. You have it all! In addition to your American flag fanny pack, you own a car sun shade, fidget spinner, many can koozies, and house slippers all with red, white, and blue stars and stripes printed on them. Now, it's time to add (perhaps) the most awesome pair of socks to your American-flag-print collection! If at first glance, you couldn't tell how super these flag socks are, just check out the attached cape in back. This essential item combines some of the coolest things like capes, socks, and the American flag into one piece of apparel and you need it. Made from a blend of spandex, these stretchy socks are comfortable and cover the feet in soft fabric. They are a knee-high style with an attached red cape in the back of each sock. 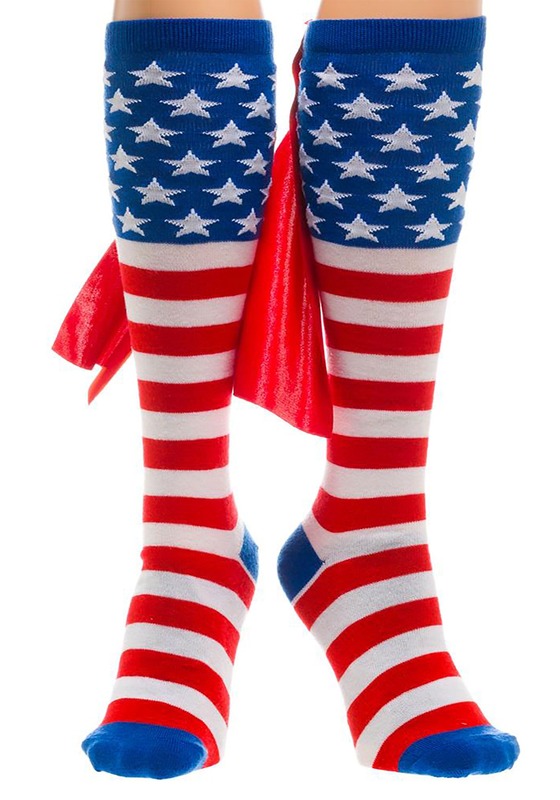 We recommend wearing these socks on the 4th of July with a pair of flip-flops— they were made to show off!